Abstract: The Verax Helado PWM-T heatsink is the newest uber-quiet heatsink from the German manufacturer Verax Ventilatoren GmbH. A couple other insightful thermal design aspects come into play to create a nice low noise thermal solution. The Verax Helado PWM-T heatsink is the newest uber-quiet heatsink from the German manufacturer Verax Ventilatoren GmbH. The Helado is a departure for the company in some respects because it does not utilize Verax's patented CAIRdB fan. So rather than a CFD based impeller that looks like it should be on the tail end of a nuclear submarine, we find a rather plane vaneaxial fan, albeit a very quiet one. Ahh the power of dual ball bearings. The fan supports Pulse Width Modulation (PWM) fan speed control via a 4-pin power connector which is backwards compatible with the legacy 3-pin variety. Comprised of a nickel plated copper base block and an array of rather thick stacked aluminum fins which have also been nickel plated, the Verax Helado PWM-T is a thin tower of a heatsink. Four parallel rows of 6mm diameter "U" shaped copper heatpipes join the base of the heatsink to its's cooling fins with soldered joints. The Helado PWM-T heatsink installs onto socket 775 Intel Pentium D processors via a set of Intel push-pin retention brackets. With the LGA775 bracket removed the heatsink will fit just as easily onto socket 754/939/940 and AM2 AMD Athlon64 processors with a spring clip that locks onto the center tab of either style of K8 heatsink retention frame. The rigidity of the clip against torsional bending leaves something to be desired however. A couple other insightful thermal design aspects come into play to create a nice low noise thermal solution. The Verax Helado PWM-T retails for about $60USD through North American distributor VeraxFans.com. There has always been a high premium on low noise cooling and that trend isn't certainly isn't slowing down. Materials: Nickel plated copper base, heatpipes and aluminum fins. 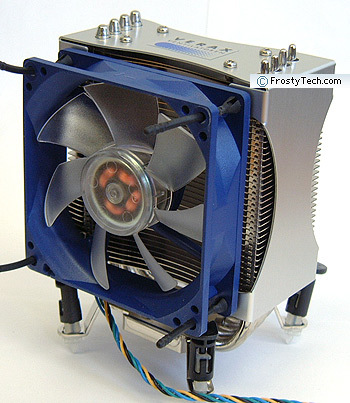 Best of all for users shopping out low noise cooling solutions, the 92x92x25mm vaneaxial fan is held in place with four rubber vibration mounting posts, not screws. The rubber posts lift and separate the fan from the adjoining aluminum fan shroud. 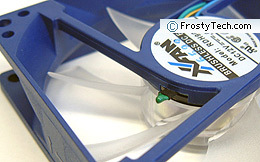 This helps to reduce fan-motor vibrations from being transmitted to the heatsink. Veraxfans.com have packs of the anti-vibration rubber fan posts up for grabs, which is great cause these little things fit just about every kind of fan out there. Apart from one really basic thing Verax could have done to the Helado to reduce potential rattles, which we'll look into momentarily, the heatsink is primed for low noise operation. List all Verax heat sinks that Frostytech tested?